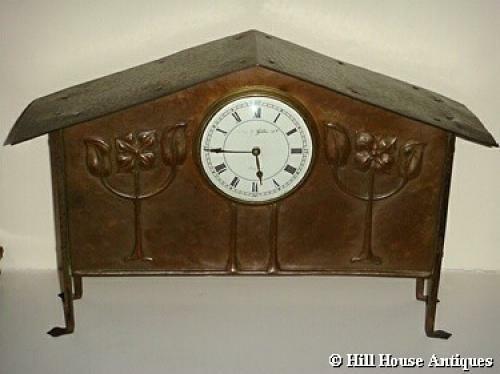 Superb Arts & Crafts Glasgow Style patinated copper (and possibly steel legs) mantel clock by Waring & Gillow of London c1900, architectural design attributed to George Walton. Stylised repousse plant motifs to front. 8 day movement. George Walton is reputed to have designed a similar clock for Goodyers of Regent St, London (see our other listing). Further ref - see "The Glasgow Style" by Gerald & Celia Larner page 87. Approx 9.5" high and 14" wide.